Tonight marks the fourth installment of Tiki nights at the Spare Room. On the bar tonight will be PKNY bartender Richie Boccato. I heard rumors of Richie’s wife, the Lady Lillet, Amanda will also be in attendance. 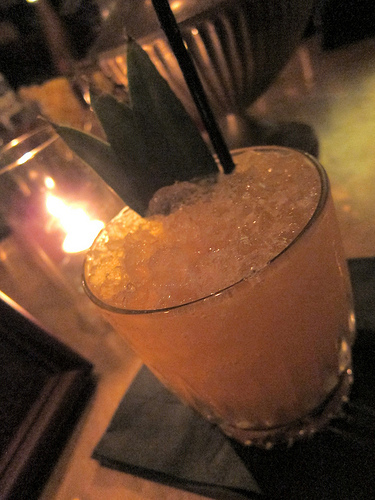 As with Ivy Mix’s guest night at Spare Room, the featured rum was Atlantico. I bellied up to the bar and ordered the first thing that caught my eye from Marcos- the Pieces of Eight (Atlantico Reserva, pineapple, passion fruit syrup, lime). 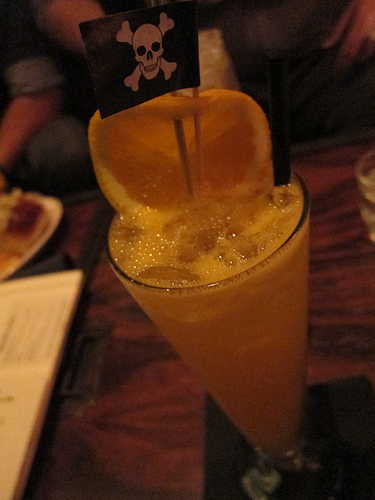 This drink was adapted from the Pieces of Eight Restaurant in Marina del Rey, CA (1960s). Next I tried Blackbeard’s Ghost by Marcos. 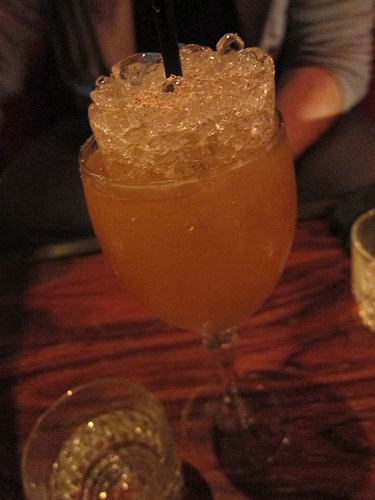 The drink featured Atlantico Platino, aged demerara rum, Velvet Falernum, lemon, orange, Angostura bitters. The drink came from the Blackbeard’s Galley Restaurant Newport Beach, CA which closed in the 1960s. I really liked this drink and before you knew it, it was all gone. A friend got the Captain’s Grog by Marcos. This drink was made with Atlantico platino, Atlantico reserva, dark Jamaican rum, dry orange curacao, Velvet Falernum, maple syrup, lime, grapefruit, almond and vanilla extracts. The ice was amazing in it! It was served “a la snowcone.” Marcos was inspired by the Hukilau Room of the Captain’s Inn in Long Beach, CA. It dates back to the 1960s. 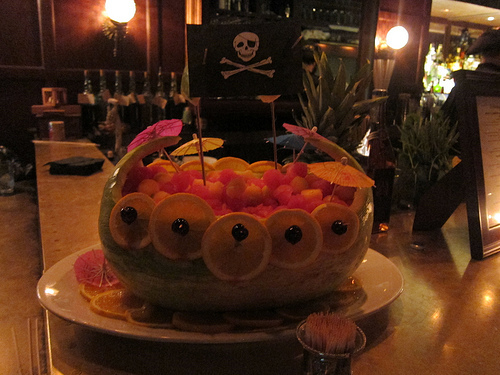 We took a little fruit break by enjoying the fruit laid out in the watermelon pirate ship Beverage Director Naomi Schimek carved. I’m really going to have to steal her tiki decorating and party planning skills one day. 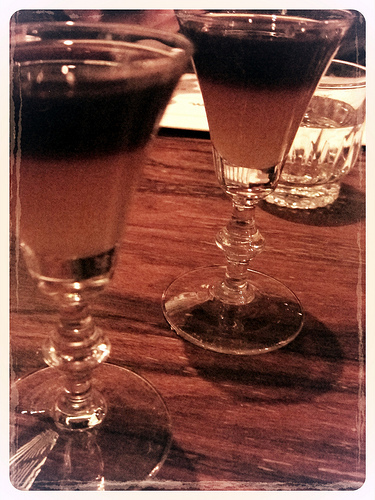 I first heard of this Angostura & Falernum shot called Faith in Medicine from Erik Trickett who used to serve it at 320 Main which is owned by Jason. Jason had a slight variation by adding the Atlantico Reserva and calling it the Mighty Sparrow. Down the hatch! Jason had a couple of other tiki drinks but you gotta be careful of all that sweet rum and fruit juice. A couple will do ya just fine. Still, it would have been nice to try the Knuckleduster (Atlantico reserva, Dry Sack Olorosso sherry, Jamaican rum, all spice dram, lime, honey, homemade falernum, nutmeg). 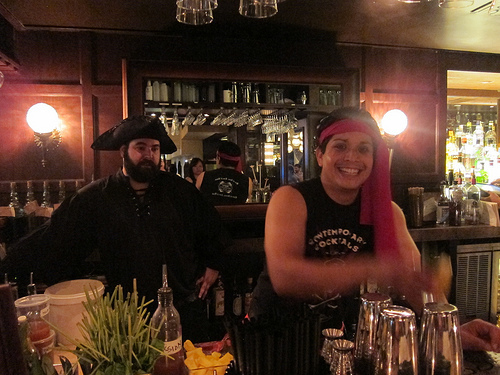 After Richie’s turn tonight, Seattle bartender Rocky Yeh joins the tiki fun on September 12. This entry was posted in alcohol education, bar stalker, bar stories, bars, bartenders, events, hot bartenders, la, la cocktails, los angeles, spirits, the minty and tagged hollywood, ivy mix, jason schiffer, marcos tello, naomi schimek, richie boccato, roosevelt, roosevelt hotel, spare room, special event, the minty. Bookmark the permalink.